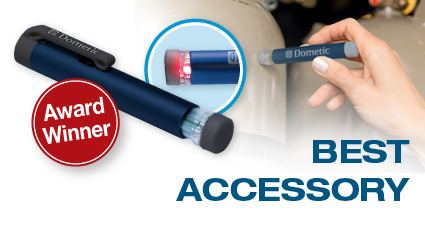 The Dometic GC100 (Gas Level Checker) is a new product which has been launched with customer safety in mind. The GC100 enables the customer to effectively calculate the level of gas remaining in their gas bottle on board their vehicle. Weighing just 25g the GC100 is a lightweight tool which is small enough to be used in any capacity. The practical device lets you know in just seconds how much gas you have remaining, with the use of a built in gas indicator this makes this process a lot simpler. The Dometic GasChecker GC100 has won Best Accessory Award in Practical Motorhome Magazine's 2013 Motorhome of the Year Awards. This product is ideal for camping, boating and recreational use. Plastic bottles, user-refillable bottles (because internal components can deflect the measurement signal), bottles smaller than 200mm or greater than 350mm diameter.